During a town hall meeting in Racine, WI, House Budget Committee Chairman Rep. Paul Ryan (R-WI) revealed the House Republican Leadership plans to pass multiple immigration bills and then combine them with the Senate legislation in the conference process to create a comprehensive bill. Ryan said the goal is to make what he and the House GOP leadership considers improvements to the Senate bill. Ryan said negotiations are ongoing in the House for when certain bills will get to the floor. “Tentatively, in October, we’re going to vote on a border security bill, an interior enforcement bill, a bill for legal immigration,” he said. The Journal-Sentinel noted that Ryan also said the House will vote on a bill that would grant illegal aliens amnesty. 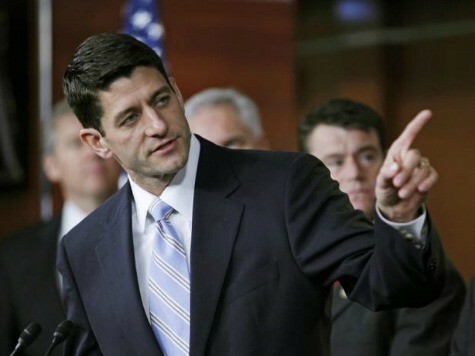 “We’re going to vote on a bill for people who are undocumented,” Ryan said. Conservatives fear a strategy like Ryan’s will not end in any serious improvement of the Senate bill, a piece of legislation even most in House GOP leadership admit is fundamentally flawed. As Breitbart News has detailed, many conservatives believe such a plan is a backdoor to amnesty provisions similar to those found in the Gang of Eight bill. In response to Ryan’s announcement this week, one congressional GOP aide said it is the wrong way to go forward because the resulting bill could end up even more convoluted and problematic than what was already passed by the Senate.